At half past six in the evening on Sunday 25 February 1883 Princess Helena of Waldeck and Pyrmont, the Duchess of Albany, gave birth to a daughter. Queen Victoria was amazed, “I can scarcely believe that dear Leopold has got a child.”1 Leopold, her fourth son, had a delicate health from birth and was a haemophiliac. He had hardly been expected to live to adulthood, nevertheless marry and father a child. The Princess was named Alice Mary Victoria Augusta Pauline. She was described by Queen Victoria as “a beautiful child”, which from the baby-hating Victoria was a great compliment. Alice was destined not to know her father and later in life she wrote, “All I can remember of my father is a faint impression of a man sitting by his writing table, wearing light-grey trousers to which I clung unsteadily and was picked up in his arms, but I have no remembrance of a face.”2 Shortly after Alice’s first birthday, as her mother was pregnant with her second child, Leopold slipped and bumped his knee. He was taken to bed and cared for and was not in a lot of pain. He went to sleep and never woke up. Helena was “greatly overcome, but quite quiet and natural.”3 On 19 July, she gave birth to a son named Charles Edward for Bonnie Prince Charlie, as Leopold had wished. From the moment of his birth, he was The Duke of Albany. Following the example of her mother, Alice was involved in charity work from an early age. At the age of 15, Alice was confirmed in a little chapel in the south of France. 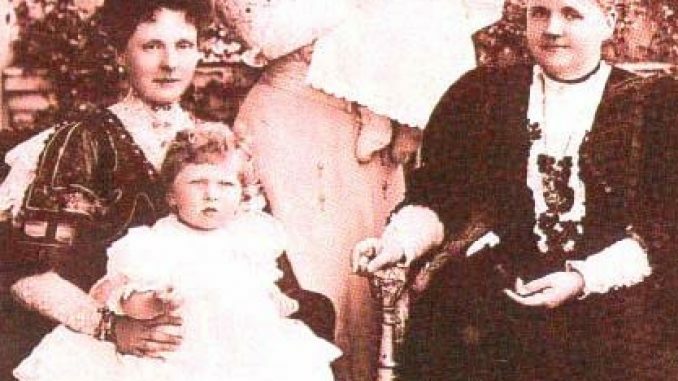 “I cannot ever be thankful enough to my dear mother for her splendid religious faith which she instilled in both my brother and myself.”5 The following year, her cousin Prince Alfred, Hereditary Prince of Saxe-Coburg and Gotha died, with life-changing consequences for Alice’s family. The duchy had been ruled by the elder brother of Queen Victoria’s husband, but he had died childless. It was then decided that the duchy would pass to Victoria and Albert’s second son, who became the Duke of Saxe-Coburg and Gotha. Alfred was his only son, and the succession to the German duchy now passed to the Duke of Connaught and his son Prince Arthur of Connaught, who both renounced their succession rights. This left Charles Edward as the obvious heir. Helena was devastated, “I have always tried to bring Charlie up as a good Englishman, and now I have to turn him into a good German.”6 Helena and her two children travelled to Coburg to present themselves to the Duke. Alice and Helena returned to Claremont in 1903, when they felt Charles Edward could handle things without them. They had been to England a few times before this, most notably for the funeral of Queen Victoria, who had died in 1901. Alice wrote, “I had come to regard her as permanent and indestructible – like England and Windsor Castle.”8 Her uncle’s coronation would be the first of many Alice would attend. Was it perhaps here that she caught the eye of her future husband Prince Alexander of Teck, the brother of the future George V’s consort Mary? So informative….website very well done. Thank you !